Today is the first day of spring and I can’t be more ready for the warmer weather. My car has especially taking a beating this year from the harsh Canadian winter and needs to get a good once over. Salt and dirt get into every nook and cranny and I know from experience what that can do to the body, upholstery and carpet of my car. It’s time to get her ready for summer! 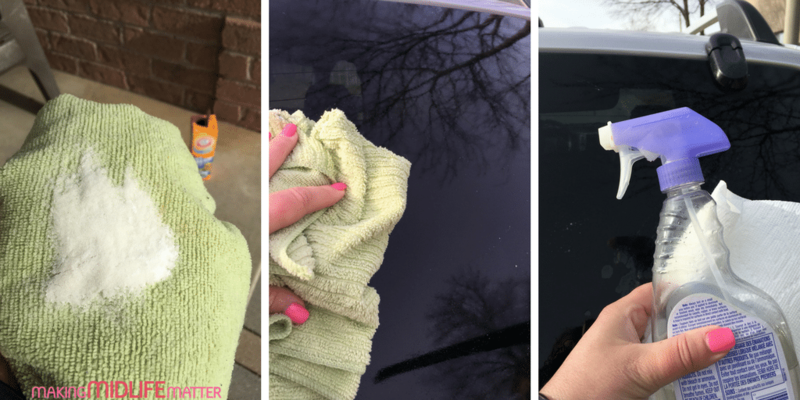 If you don’t want to be embarrassed picking up passengers AND help your car retain it’s value, follow these deep, car cleaning hacks to get that just drove it off the lot clean feeling. I put together an ultimate car cleaning kit with everything you will need to get your car detailed and looking showroom ready. 1. 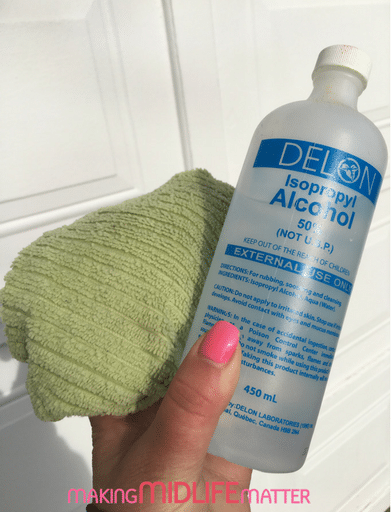 You don’t need new car mats, you just need to clean them. Trust me when I say this is the best hack EVER! Look how disgusting mine were in the before picture. 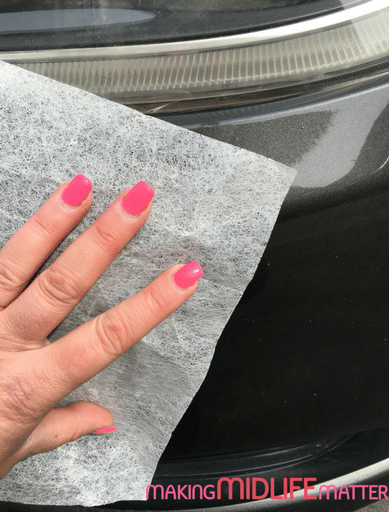 After you remove your mats from your car, smack ’em good against the side of your house to get all the loose bits out then…put them in the dishwasher. Yes, dishwasher. Be sure to check out where your spray arms aim and arrange them so that the water can reach the mats wherever you place them. Pop in a cleaning tab and set it to the shortest cycle. 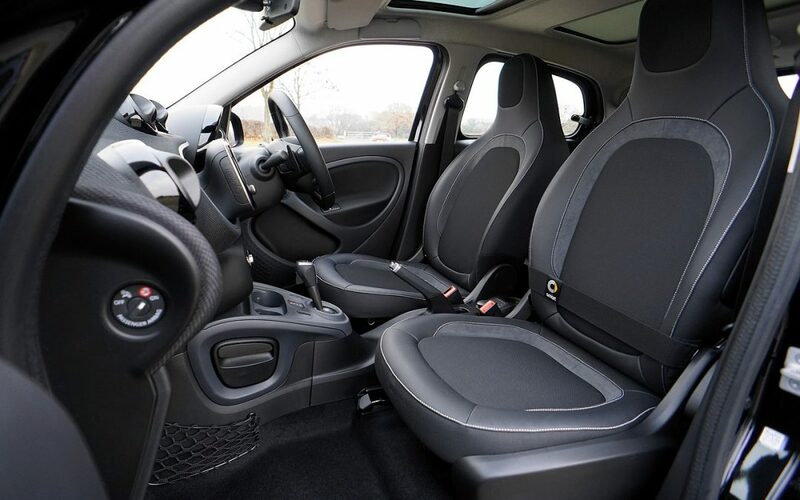 By the time you are finished cleaning the car, the car mats will be ready to put back in. 2. Give your car a shiny look. If it’s safe enough for your head, it’s good enough for your car. Add 2 good squirts of hair conditioner to a bucket of tepid water and wash your car using a microfibre cloth. Rinse and buff with a dry cloth. This will give your car a nice shine without a waxy build up. 3. 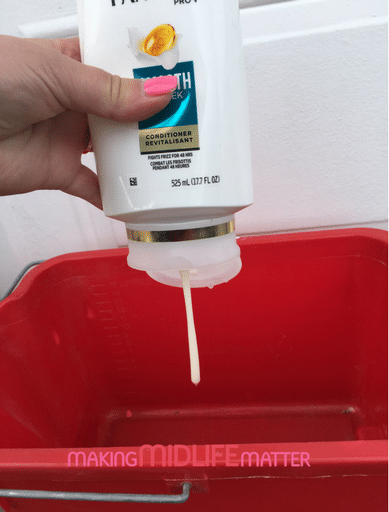 Get Rid Of Bugs. The front bumper of your car can get covered in bug guts. Gently rub them off using a dryer sheet. 4. 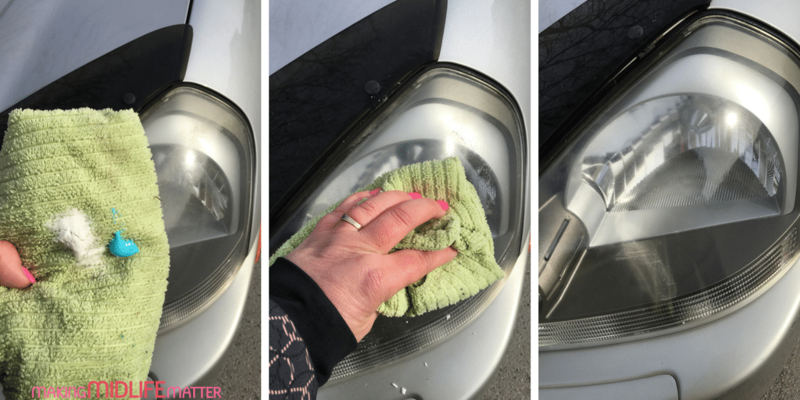 Remove headlight cloudiness. Put a dab of baking soda and toothpaste on a damp microfibre cloth. Rub entire headlight area. Buff off using clean, damp microfibre cloth. Be sure to turn the cloth with every wipe so that you don’t deposit the mixture back on to the area. 5. I can see again! When the sun starts to shine, you can really see the build up that living in a steel town creates. It takes more than window cleaner to get rid of that. On a damp cloth, sprinkle some baking soda. Smush the cloth to make a paste. Gently rub on the windshield in a circular motion. 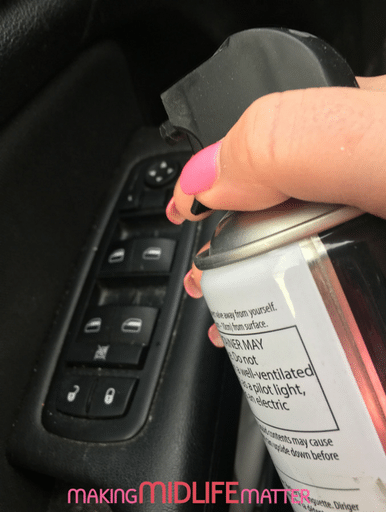 Once you have covered the entire window with your paste, spray the windshield with a mixture of half water, half cleaning vinegar. Use a clean, damp, microfibre cloth to remove. Be sure to turn cloth with every swipe till all residue of the baking soda mixture is removed. Buff with a dry microfibre cloth to a sparkling clean. My husband is a smoker so I use this method on the inside of the windows too to remove the cloudy build-up. 6. Get rid of windshield wiper streaks. If you have fairly new wiper blades and they are not working as good as they should, simply grab a microfibre cloth, dab some rubbing alcohol on it and swipe down your blades. 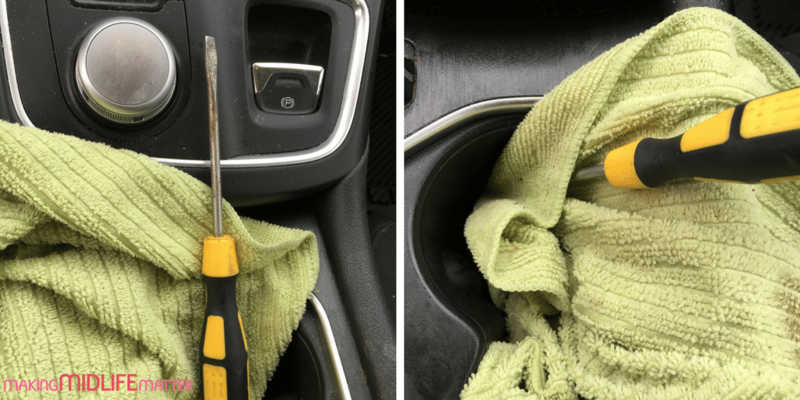 This will remove any buid-up or residue stuck to your wipers. 7. Clean your instruments & vents. 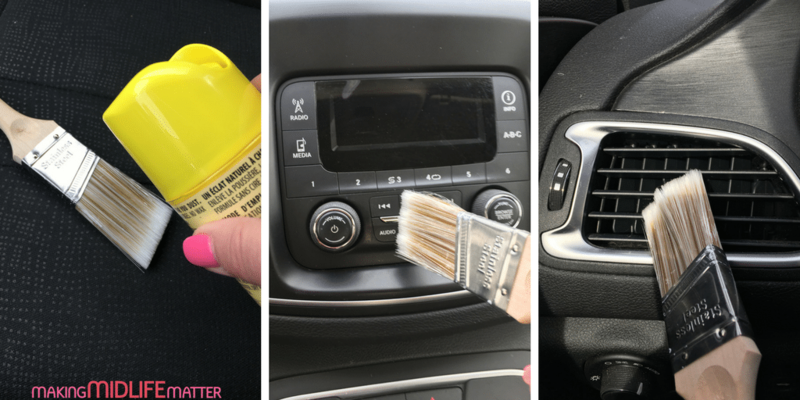 Use a painter’s brush, lightly sprayed with furniture polish to clean and pick up dust deposited on your dash and in your vents. 8. Get in tight or odd spaces. 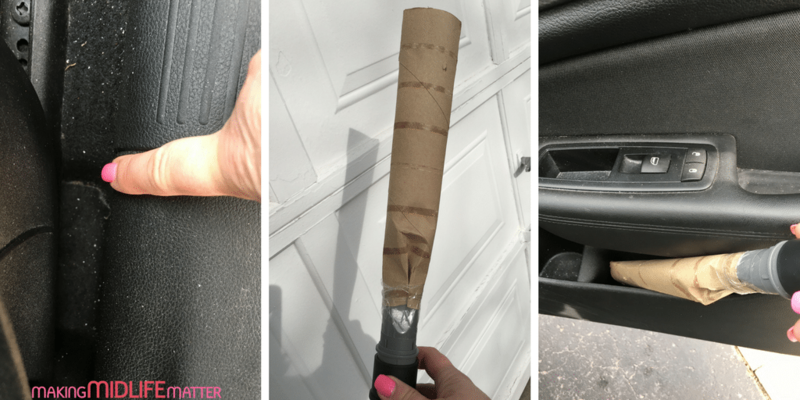 This is another genius hack to reach all the places your vacuum and it’s attachments can not reach, like between the seats or in the side pockets. 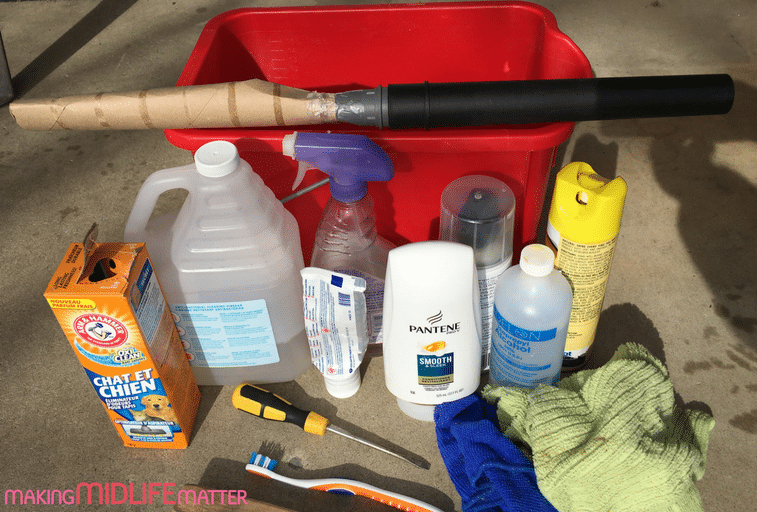 Tape an empty paper towel roll to the end of your hose.You can bend the tube to get in just about everywhere. 9. Get the salt out. Our boots track in a lot of snow and salt over the winter and that can stain your carpets. That stuff is stubborn as all to get out too. 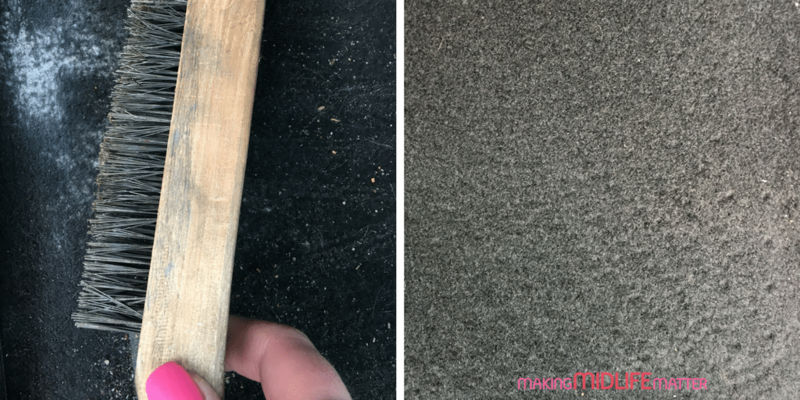 Using a steel, hard wire brush, gently lift all the salt out of the carpet. Vacuum thoroughly to have them looking good as new. 10. Clean the cup holders and crevices. My husband is so bad with his coffee in the car. It spills everywhere, then dries to a nice cakey mess. Using a flat head screwdriver and a damp microfibre cloth, it comes up easily and gets into all the lines. 11. Door control panels. My husband is a smoker so ash gets into the controls and it is difficult to get it out. Using a can of compressed air, I blow it all out easily. 12. Upholstery seams. 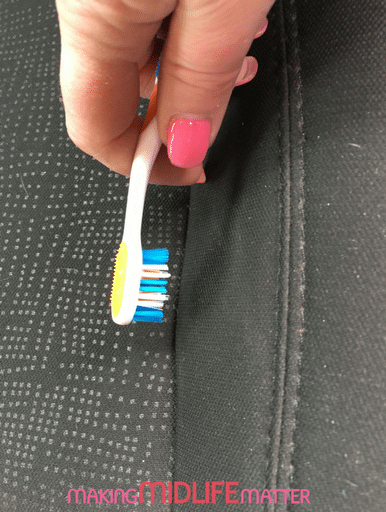 Use a toothbrush to loosen any debris stuck in the seams. Use a vacuum at the same time to catch it before it deposits somewhere else. 13. Remove stubborn pet hair. I love my dogs but they make a mess of my car. 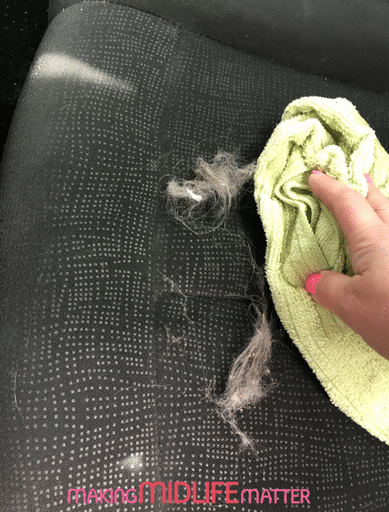 The easiest thing to lift pet hair is a damp, microfibre cloth. Rub gently and vacuum away. 14. Make your dash shine. You don’t need chemicals to shine your dash. 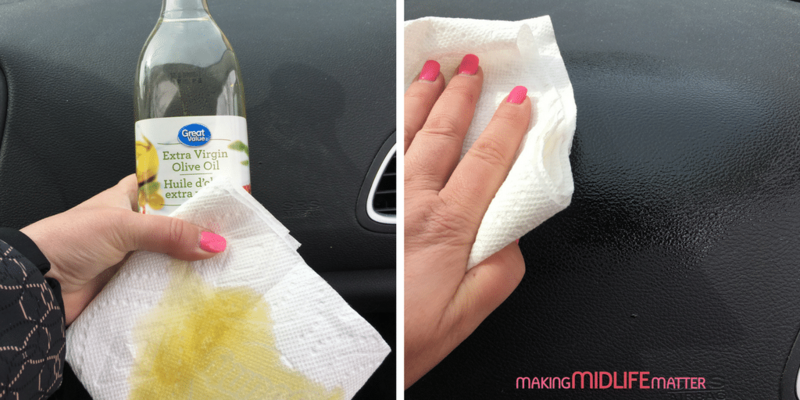 Add a few drops of olive oil to a paper towel and rub it on your dash. Use a clean cloth to remove access and buff. 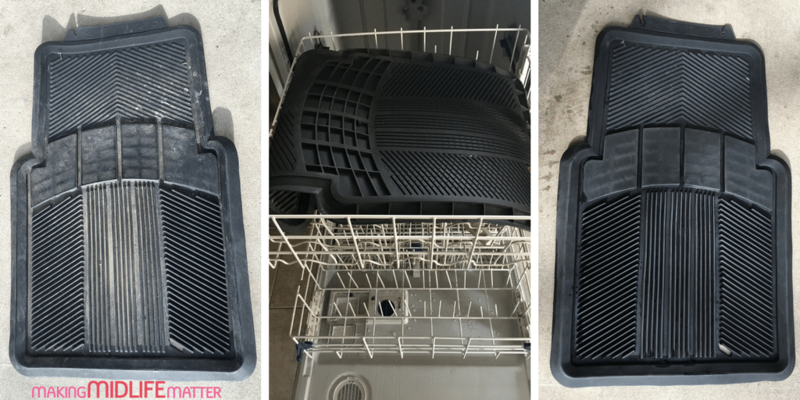 Your mats should be done in the dishwasher by now so go get them and put them back into your super clean, detailed car. Now you are ready for a road trip!